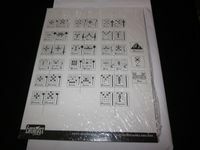 Pre-printed game board and player pieces from Catalyst Game Labs. Comes shrink wrapped in plastic with cardboard between the sheets. Just cut out the playing pieces, fold, and tape.